SANTA MONICA, Calif. - The man sitting in the big comfy chair in the big comfy office in Santa Monica looks familiar and sounds familiar but - in some hard-to-define way - he is not familiar at all. He turns 64 in December yet remains youthful in a way that only California and good genes can confer. But what is so different about Steven Bochco may be this: He is reflective and even philosophical. "I'm not chasing the way I used to," says someone who spent four decades in the chase and changed television in the process. There is an autumnal air about Bochco. And Bochco, you should understand, is not an autumnal sort of guy. He is not chasing, and he is hardly producing TV either. Steven Bochco Productions - the banner that flew over "NYPD Blue" for more than a decade - started shooting a pilot for TNT last week titled "Raising the Bar." It's about a public defender in the Bronx and stars Jane Kaczmarek and Mark-Paul Gosselaar. An association with ABC (and more recently Touchstone) that dates to 1987 ends shortly, and it probably will end badly. In late 2005, ABC asked Bochco to salvage "Commander in Chief," a drama about the first female US president. Of that rescue mission, Bochco now ruefully says, "no good deed goes unpunished. . . . It was a horrible, horrible experience. It really sort of crystallized the way in which the business has changed, and that's not for me anymore." He has little interest in working for the networks - too much micromanaging - though readily admits the feeling may be mutual. "I don't think there's a big appetite for the stuff I like to do." In the argot of the trade, Bochco is a reality-based drama producer in a business crawling with "high-concept" fantasists who draw their inspiration from comic books. "You're looking at 400-year-old cops and detectives who are vampires. . . . It's fine. I don't have any disdain for it. It's just not what I do," he says. What Bochco has done well are cop and legal dramas. He's arguably the most successful drama producer in TV history - nine Emmys, a pair of Humanitas prizes, and a penchant for pushing the boundaries of content and language, which made him a controversial figure at the outset of the "NYPD Blue" run in 1993. Mostly though, he just produced great TV: "Hill Street Blues," "L.A. Law," a pair of comedies for ABC ("Hooperman" and "Doogie Howser, M.D. "), a cult hit ("Murder One"), and what certainly was the most interesting failure of the past 20 years - "Cop Rock," a drama filled with crooning patrolmen and operatic lieutenants. 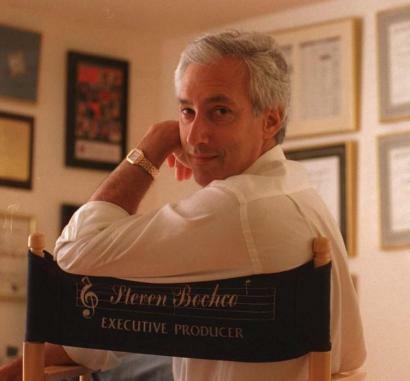 "Blue," which he co-created with David Milch (who has an office just down the hall), made Bochco a household name in an industry where only stars are usually accorded such a distinction. Like "Hill Street" for NBC, it set the stage for an ABC resurgence and lent the once-maligned TV drama respect and even esteem. One of Bochco's longtime friends, James Sikking - the veteran actor who played Lt. Howard Hunter on "Hill Street" and starred in half a dozen other Bochco shows - says, "I would kick his [expletive] if he were bitter. Come on - Steven has had extraordinary success and . . . I would never let him fall into that category. You'd have to be a really shallow [jerk] . . . and he is not that at all - not that at all." The guy in the big comfy chair doesn't seem bitter at all. He seems pretty happy, in fact, but he is also bluntly pragmatic. He's gotten older, and audience tastes have changed. They're not his tastes. "I always promised myself that if I ever got to be that person, I'd stop doing it," he says, adding, "I really don't feel like banging heads with the current generation of network-runners."